The LRC features an advanced Fujitsu ScanSnap ix500. 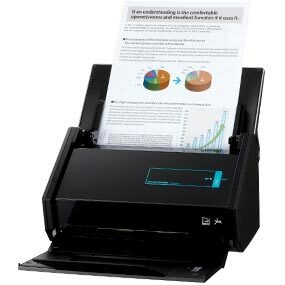 This double sided scanner can turn a 30 page document into a searchable pdf file in seconds. Available to all students and staff at our fast scanning workstation. Just ask one of our LRC staff members for assistance in setting up. The ScanSnap iX500 is the scanner that intuitively guides you through every step of the scanning process, and lets you access your documents anywhere and anytime. Scan to and view across a range of popular cloud services, or wirelessly scan to your PC, Mac, iPad/iPhone, and Android devices. A host of automated settings are designed for effortless scanning. Scan your everyday documents, from business cards to A4 and even A3 paper. Once scanned, you can send the data to Word, Excel, e-mail, and SharePoint amongst others. Wirelessly scan to your PC or Mac as well as iOS or Android mobile devices. The iX500 scans everyday documents intuitively with ease, no matter the size. Use of a carrier sheet enables iX500 users to digitize larger documents (A3/B4), as well as magazine and newspaper clippings and photographs. Such document containing carrier sheets can be scanned successively or mixed in with regular paper documents. The Quick Menu can be set up to display your 'Favorite' scanning destinations or will 'Recommend' an application. For example, scan a business card which will then be automatically recognized and a list of business card-related applications will be recommended. Does your Windows application have an import or browse command? If so you can now easily scan directly to this application even when no scanning interface is available assuming it supports .pdf or .jpg. Simply browse to the new 'ScanSnap Folder' within your local computer, hit the blue scan button, and your document will then be automatically imported into your application and then deleted from 'ScanSnap Folder'. The ScanSnap iX500 comes bundled with Adobe Acrobat X Standard (for Windows only), which enables users to move beyond merely "seeing" and "printing" generated data, to editing generated PDF files however they like. It generates password and digital ID attached PDF files that are ideal for safeguarding personal information and other confidential information that needs to be protected.